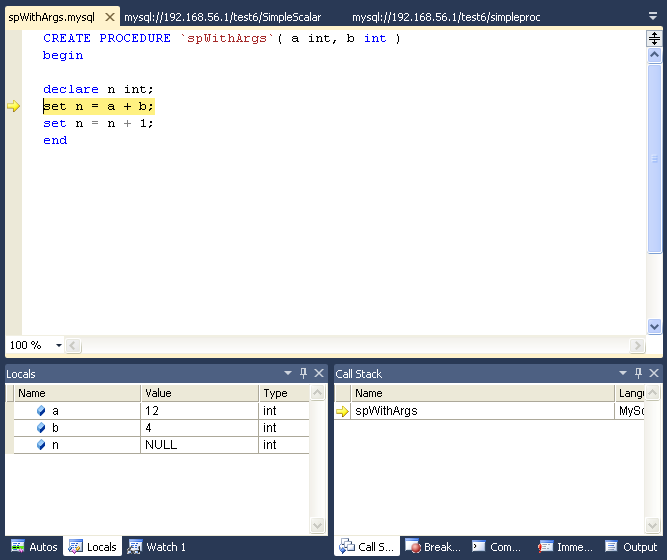 The stored procedure debugger provides facilities for setting breakpoints, stepping into individual statements (Step Into, Step Out, Step Over), evaluating and changing local variable values, evaluating breakpoints, and other debugging tasks. The debugger recreates at the start of each debug session a serversidedebugger database in your server. This database helps to track the instrumented code and implement observability logic in the debugged routine. Your current connection needs to have privileges to create that database, and its associated stored routines, functions, and tables. Choose a connection in the Visual Studio Server Explorer. Expand the Stored Procedures folder. Only stored procedures can be debugged directly. 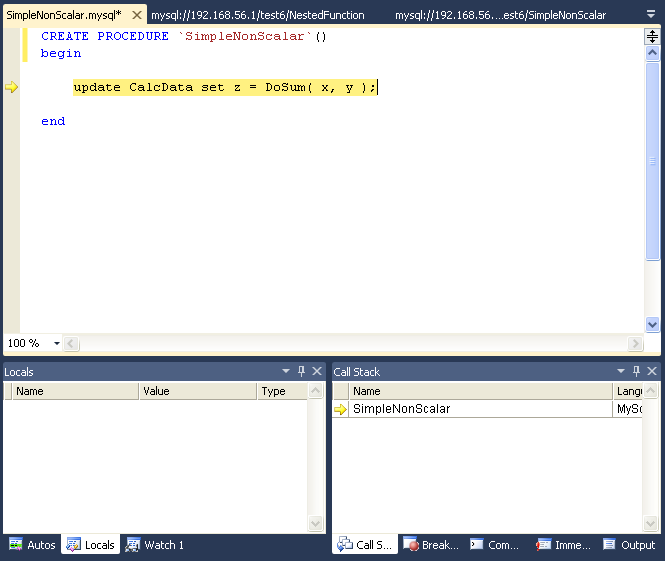 To debug a user-defined function, create a stored procedure that calls the function. Click on a stored procedure node, then right-click and from the context menu choose Debug Routine. At this point, Visual Studio switches to debug mode, opening the source code of the routine being debugged in step mode, positioned on the first statement. If the initial routine you debug has one or more arguments, a pop-up will show up with a grid (a row per each argument and three columns: one for the argument, one for the argument value (this is editable) and one for nullifying that argument value (a checkbox). After setting up all the argument values, you can press OK to start the debug session, or Cancel to cancel the debug session. To have visibility into the internal workings of a stored routine, the debugger prepares a special version of the procedure, function, or trigger being debugged, instrumented with extra code to keep track of the current line being stepped into and the values of all the local variables. Any other stored procedures, functions, or triggers called from the routine being debugged are instrumented the same way. The debug versions of the routines are prepared for you automatically, and when the debug session ends (by either pressing F5 or Shift + F5), the original versions of the routines are automatically restored. 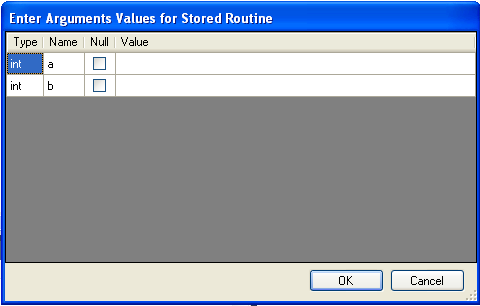 A copy of the original version of each instrumented routine (the version without instrumentation) is stored in the AppData\Roaming\MySqlDebuggerCache folder for the current Windows user (the path returned by calling System.Environment.GetFolderPath(Environment.SpecialFolder.ApplicationData) in .NET, plus appending MySqlDebuggerCache. There is one file for each instrumented routine, named routine_name.mysql. For example, in Windows 7, for a user named fergs, the path is C:\Users\fergs\AppData\Roaming\MySqlDebuggerCache. Two threads are used, one for the debugger and one for the routine being debugged. The threads run in strict alternation, switching between the debugger and the routine as each statement is executed in the stored routine. To show the Locals tab, choose the menu item Debug, Windows, Locals. The Locals tab lists all the variables available in the current scope: variables defined with DECLARE at any point in the routine, argument parameters, and session variables that are referenced. If the last step operation changes the value of a local, its value will be highlighted in red (until another statement is executed or stepped. You can change the value of any local. To show the Watch tab, choose the menu item Debug, Windows, Watch. To define a watch, type any valid MySQL expression, optionally including function calls. If the watch evaluation makes sense in the current context (current stack frame), it will show its value, otherwise it will show an error message in the same row the watch was defined. the locals will list the extra variables new.id and new.myname. For an UPDATE trigger, you will also get the extra variables old.id and old.myname. These variables from the new and old objects can be manipulated the same way as any ordinary local variable. 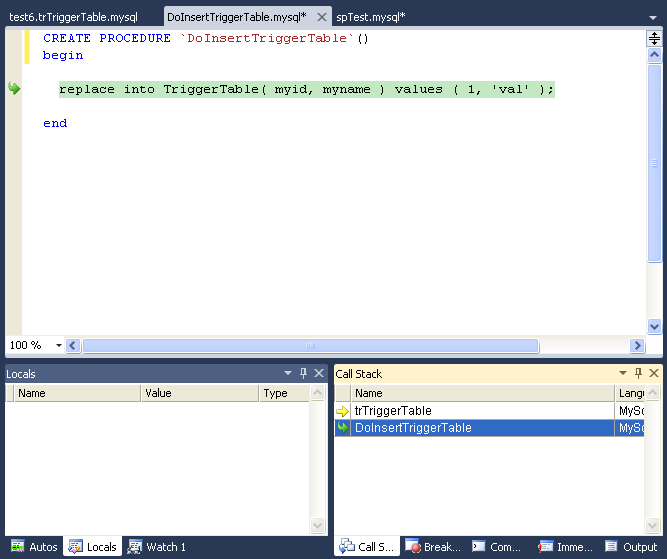 To show the Call Stack tab, choose the menu item Debug, Windows, Call Stack. The stack trace (in the Call Stack tab) will list all the stack traces, one for each routine invocation. The one with a yellow mark is the current stepping point. Clicking in another will activate in the editor the tab for that routine source, highlighting in green the last statement stepped. Stepping of a new routine starts in the first executable instruction (excluding declares, handlers, cursor declarations, and so on). To step into the code of a condition handler, the condition must be triggered in the rest of the MySQL routine. The next statement to be executed is highlighted in yellow. To continue stepping, you can choose between Step Into (by pressing F11), Step Out (by pressing F10) or Step Over (by pressing Shift + F11). 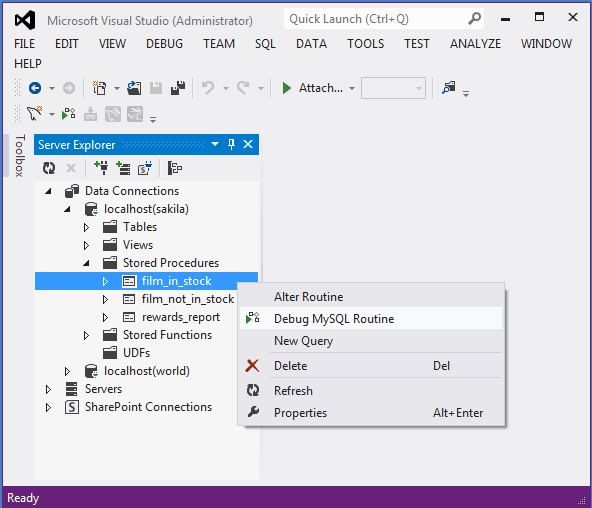 You can step out of any of functions, triggers or stored procedures. If you step from the main routine, it will run that routine to completion and finish the debug session. When stepping into a single statement, the debugger will step into each individual function invoked by that statement and each trigger fired by that statement. The order in which they are debugged is the same order in which the MySQL server executes them. 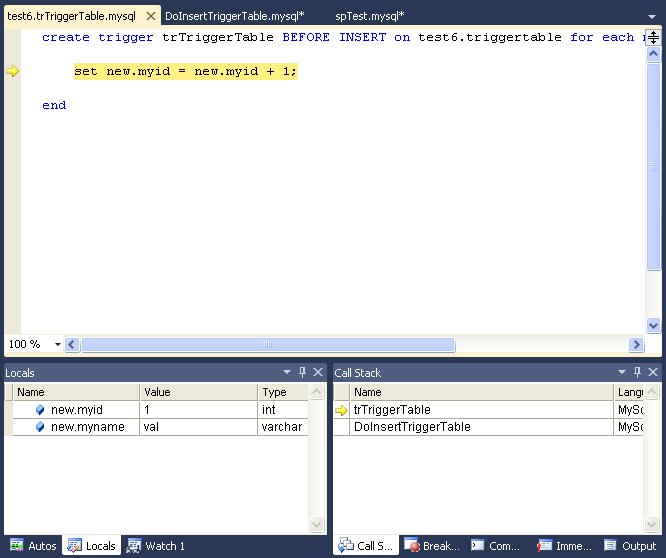 You can step into triggers triggered from INSERT, DELETE, UPDATE, and REPLACE statements. Also, the number of times you enter into a stored function or trigger depends on how many rows are evaluated by the function or affected by the trigger. For example, if you press F11 (Step Into) into an UPDATE statement that modifies three rows (calling a function for a column in the SET clause, thus invoking the function for each of the three rows), you will step into that function three times in succession, once for each of the rows. You can accelerate this debug session by disabling any breakpoints defined in the given stored function and pressing Shift + F11 to step out. 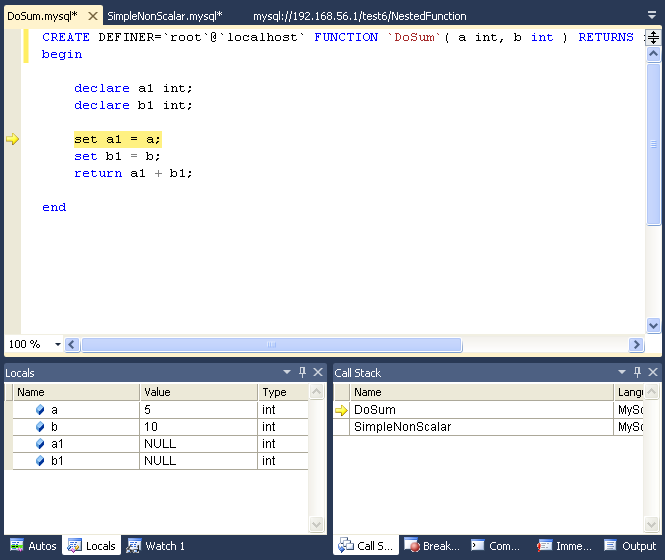 In this example, the order in which the different instances of the stored function are debugged is server-specific: the same order used by the current MySQL server instance to evaluate the three function invocations. 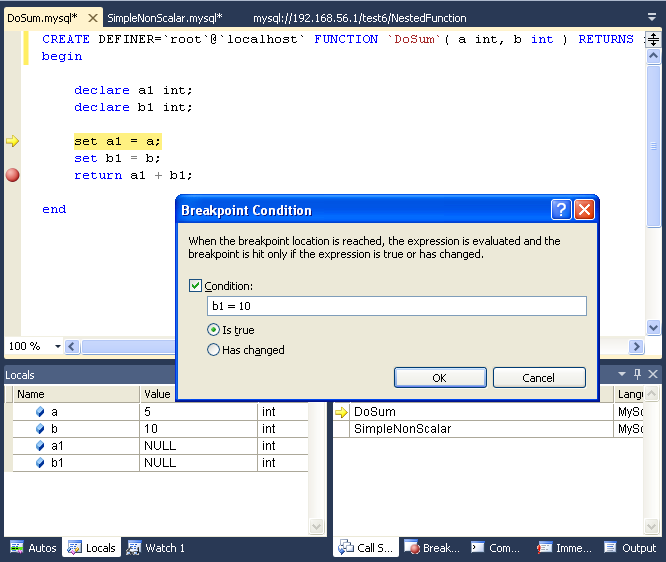 To show the Breakpoints tab, choose the menu item Debug, Windows, Breakpoints. 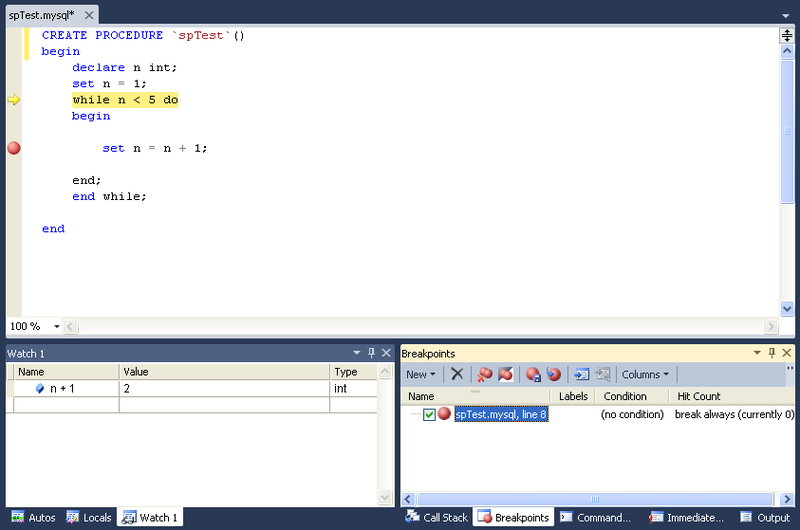 The Breakpoints tab will show all the breakpoints defined. From here, you can enable and disable breakpoints one by one or all at once (using the toolbar on top of the Breakpoints tab). You can define new breakpoints only in the middle of a debug session. Click in the left gray border of any MySQL editor, or click anywhere in a MySQL editor and press F9. In the familiar Visual Studio way, you press F9 once to create a breakpoint in that line, and press it again to remove that breakpoint. Once a breakpoint is defined, it will appear enabled (as filled red circle left to the current row if that line is a valid statement to put a breakpoint) or disabled (as a non-filled red circle left to the current row if that row is not valid to put a breakpoint). To define pass count breakpoints, after creating the breakpoint, right click in the red dot and choose Hit Count.... In the pop-up dialog, define the specific condition to set. For example, break when the hit count is equal to and a value 3 will trigger the breakpoint the third time it is hit. 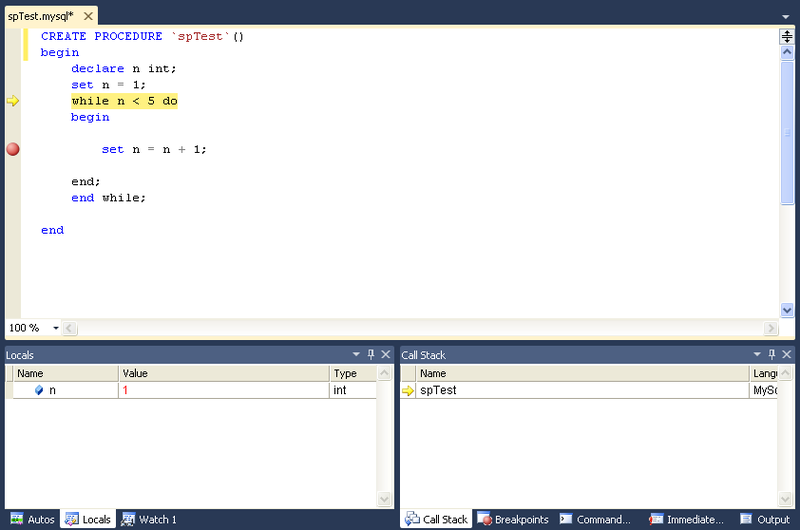 To abort the debug session (and the execution of the current call stack of routines), press Shift + F5. To run the routine to completion (or until next breakpoint hit), press F5. For all functionality you can use (in addition to the shortcuts documented), see the options in the Debug menu of Visual Studio. Code being debugged must not use get_lock or release_lock MySQL functions, since they are used internally by the debugger infrastructure to synchronize the debugger and the debugged routine. Code being debugged must avoid using any transaction code (START TRANSACTION, COMMIT, ROLLBACK) due to the possibility of wiping out the contents of the debugger tables. (This limitation may be removed in the future). You cannot debug the routines in the serversidedebugger database. The MySQL server running the routine being debugged can be any MySQL server version after 5.0, and running on any supported platform. Always run debug sessions on test and development servers, rather than against a MySQL production server, because debugging can cause temporary performance issues or even deadlocks. The instrumented versions of the routines being debugged use locks that might not pertain to the rest of the production code.